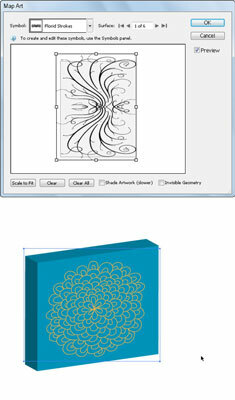 In Adobe Creative Suite 5 (Adobe CS5) Illustrator you have the option of adding art to your newly created 3D object. The function is called Map Art and is a special 3D effect where content from the symbol library onto the surface of a 3D object. Select the desired 3D object. Click the Map Art button. The Map Art dialog box opens, as shown at the top of the second figure. Use this dialog box to apply artwork to a 3D object. In the Map Art dialog box, you can select a surface and apply a symbol to it. Using the Surface arrow buttons, select the surface the artwork should be applied to and then choose a symbol from the Symbol drop-down list. The result is shown at the bottom of the preceding image. An object must be a symbol to be used as mapped artwork. You simply need to select and drag to the Symbols panel the artwork you want mapped, to make it a selectable item in the Map Art dialog box. The light gray areas in the Preview pane are the visible areas based on the object’s present position. Drag and scale the artwork in this pane to place the artwork where you want it. Shaded artwork (enabled by selecting the Shaded Artwork check box at the bottom of the Map Art dialog box) looks good but can take a long time to render. All 3D effects are rendered at 72 dpi (dots per inch; low resolution). You can determine the resolution by either choosing Effect→Document Raster Effects Settings or saving or exporting the file. You can also select the object and choose Object→Rasterize. After the object is rasterized, you can no longer use it as an Illustrator 3D object, so save the original!